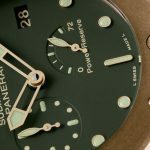 Two years ago Panerai released the Panerai PAM 382 Bronzo that made waves within in the Paneristi community. 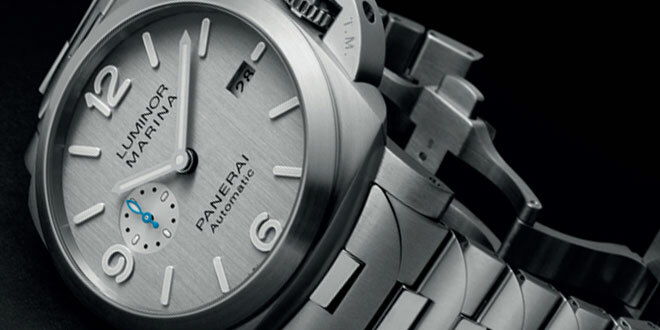 It was something out of the box and till this day it is one of the hottest Panerais to own. 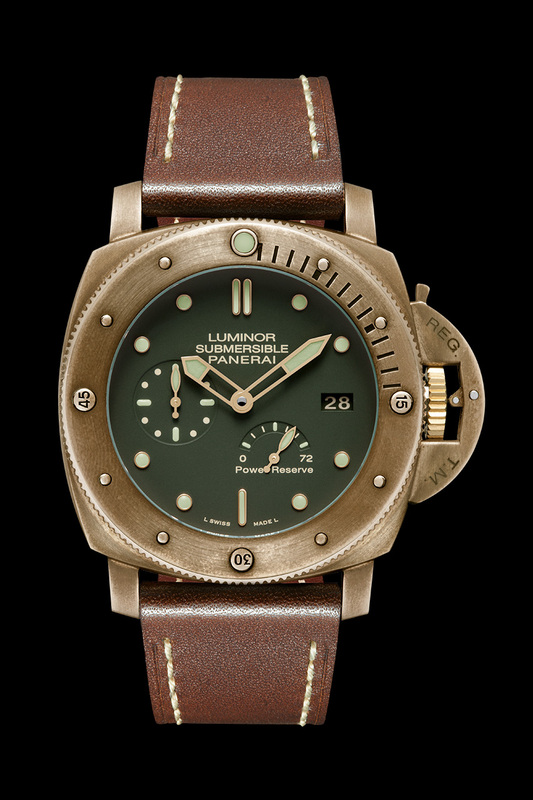 Each one starts out as their counterparts all new and shiny, but after time the patina these bronzo take one make them unique to every owner out there. We have seen the price on these soar because of how desirable they are and how limited the production was. 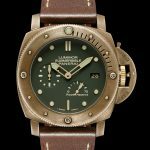 Flash forward to SIHH 2013 and Panerai has brought us another Bronzo, the Panerai PAM507 Submersible Like it’s predecessor the PAM507 will be enclosed in a bronze submersible case and limited to only 1000 pieces worldwide. 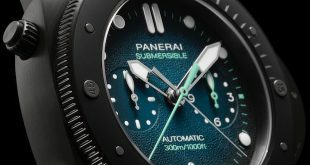 There are few differences with the new PAM507 as compared to the PAM382. 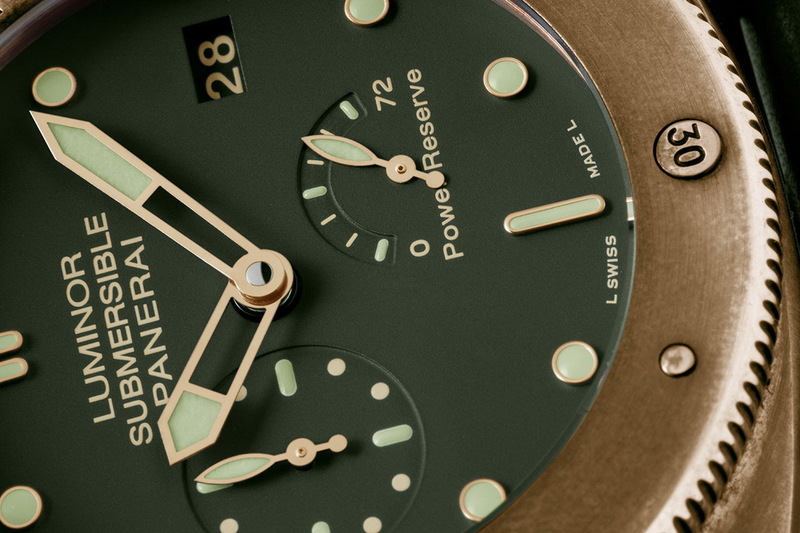 First off you will notice that the PAM507 has a power reserve indicator on the face where as the PAM382 did not. 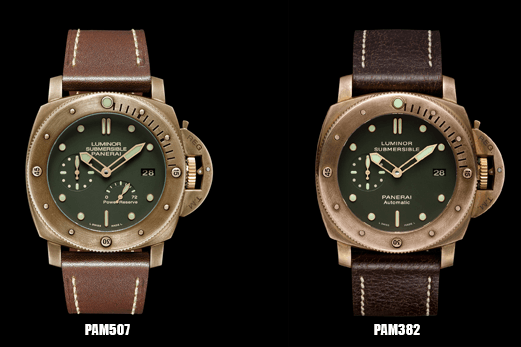 The PAM507 features a Panerai P.9002 Calibre compared to the P.9000 movement that is present in the PAM382. 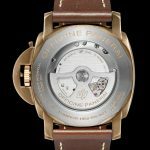 The newer P.9002 movement also features 29 jewels and 237 components while the PAM382 had 28 Jewels and 197 components in it’s In-House Movement. 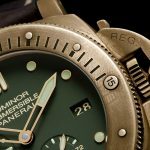 One advantage the PAM382 does have is that the crystal is 4mm thick vs the new one having a 2.9mm thick crystal. 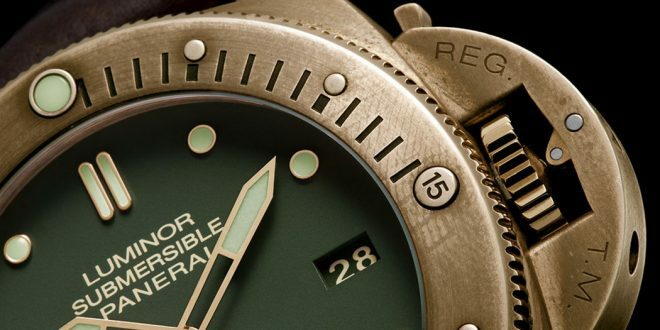 The rest of the features of the new Bronzo is pretty much identical to the previous release. 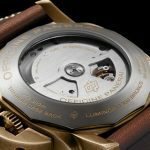 MOVEMENT – Automatic mechanical, Panerai P.9002 calibre, executed entirely by Panerai, 13¾ lignes, 7.9 mm thick, 29 jewels, Glucydur® balance, 28,800 alternations/hour. Incabloc® anti-shock device. 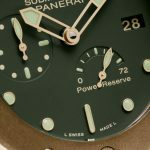 Power reserve 3 days, two barrels. 237 components. 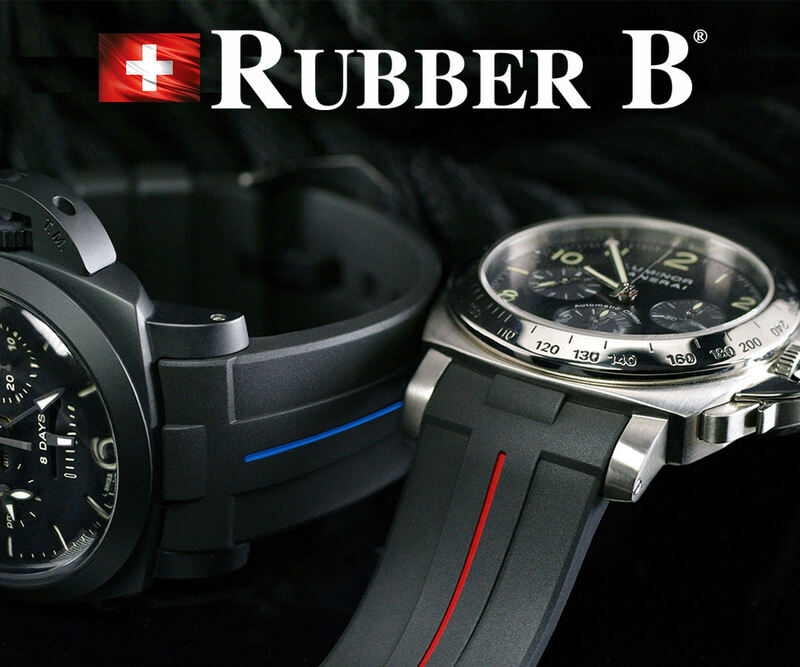 FUNCTIONS – Hours, minutes, small seconds, date, seconds reset, power reserve indicator, calculation of immersion time. 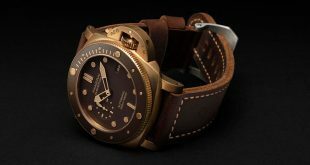 CASE – Diameter 47 mm, brushed bronze. 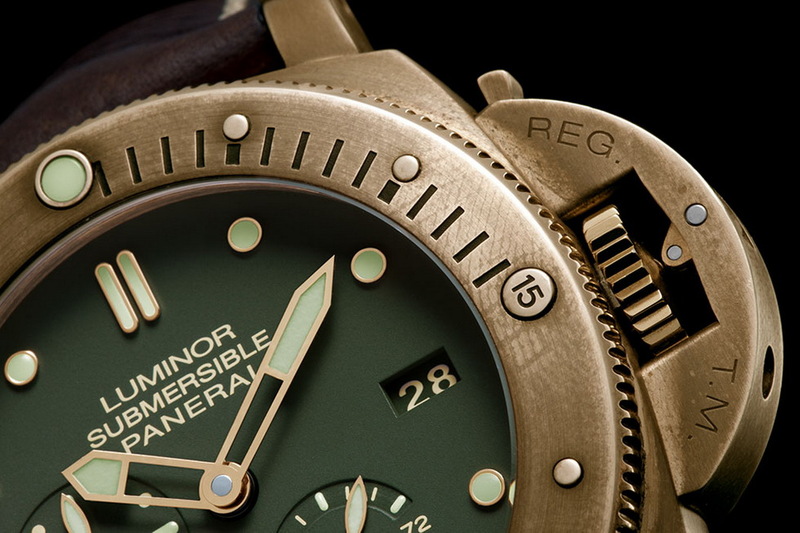 BEZEL – Brushed bronze with polished edges, anti-clockwise unidirectional rotating bezel with graduated scale for calculating the time of immersion and ratchet click at minute intervals. 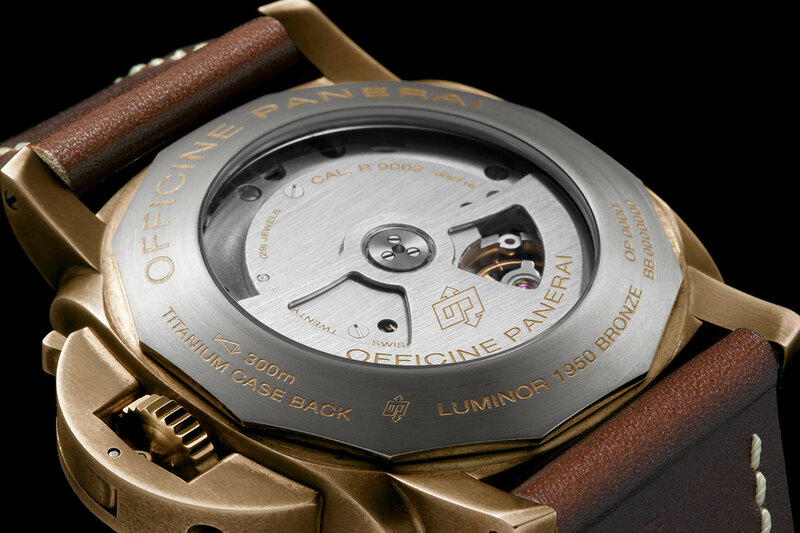 BACK – Brushed titanium with see-through sapphire crystal. 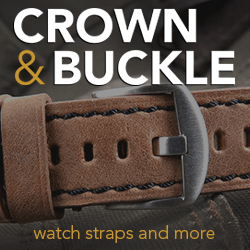 DEVICE PROTECTING THE CROWN – (protected as a trademark) Brushed bronze. 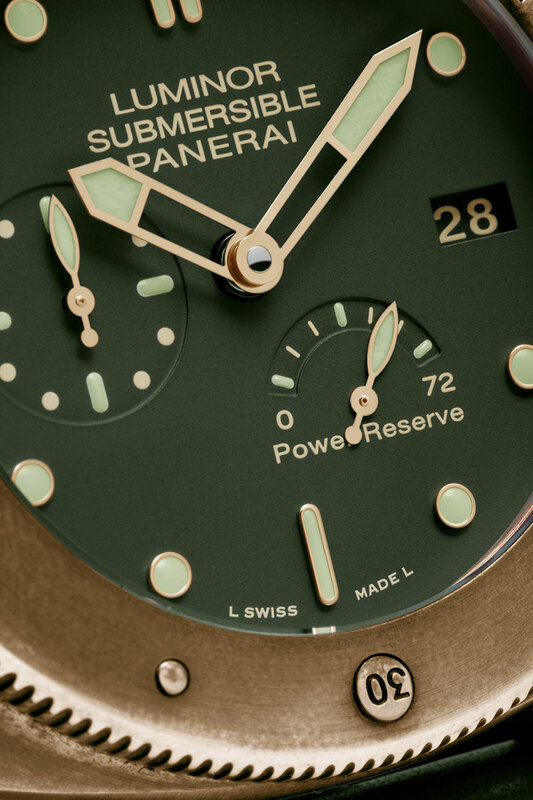 DIAL – Green with applied luminous hour markers. Date at 3 o’clock, seconds at 9 o’clock, power reserve indicator at 5 o’ clock. CRYSTAL – Sapphire, made of corundum, 2.9 mm thick. Anti-reflective coating. 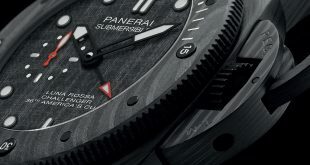 WATER RESISTANCE – 30 bar (~ 300 metres). 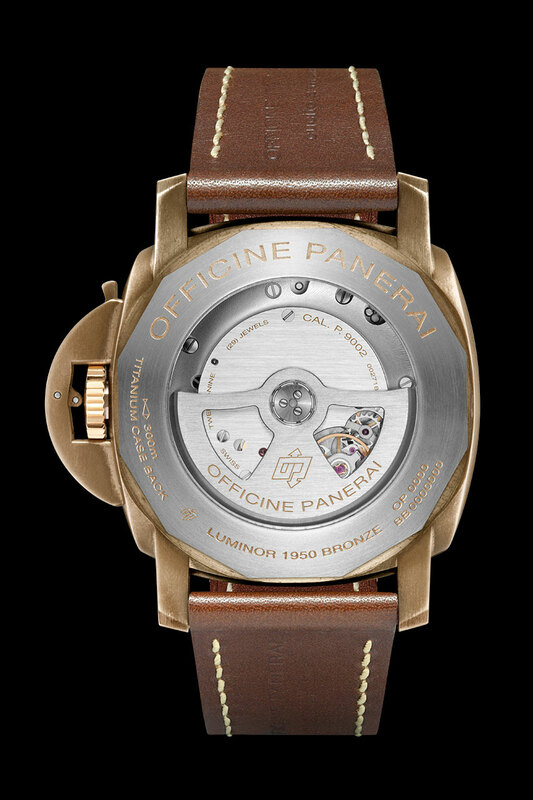 STRAP – PANERAI personalised leather strap and trapezoidal brushed titanium buckle. 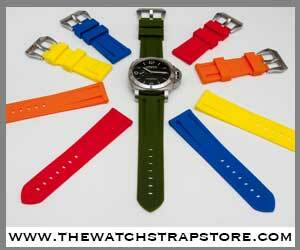 Supplied with a second interchangeable strap and a steel screwdriver.